A Wichita real estate company says the Starlite Drive-In on the city's south side has a new owner, saving the beloved theater that was thought to have closed for good in October. 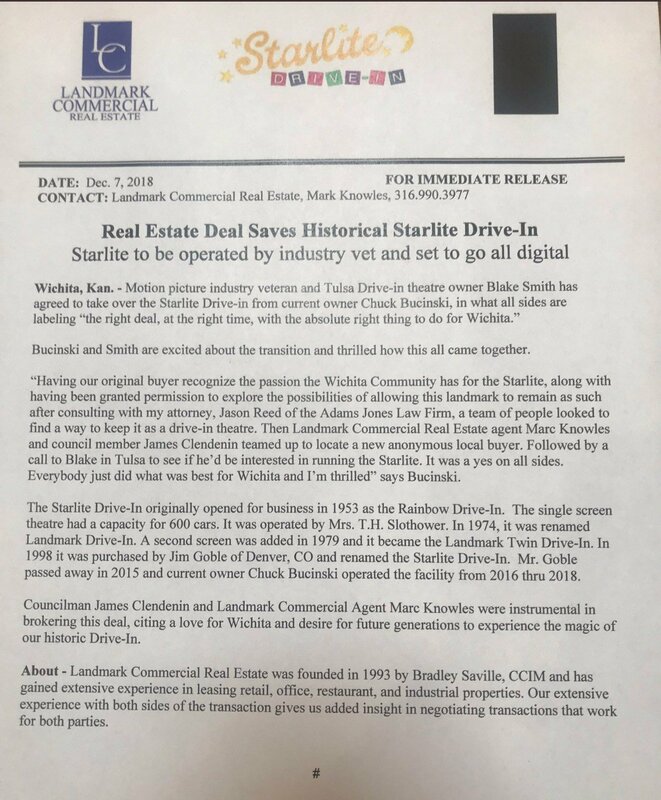 Landmark Commercial Real Estate announced Friday that Tulsa drive-in theater owner Blake Smith has agreed to take over the Starlite in south Wichita from current owner Chuck Bucinski. It will reopen under the same name next spring. A news release says all sides are calling it "the right deal, at the right time, with the absolute right thing to do for Wichita." The real estate company says Wichita City Councilman James Clendenin and Landmark agent Marc Knowles were instrumental in brokering the deal. Clendinin said the digital equipment will be costly. The City Council will consider providing a $200,000 loan to be paid back with interest. The funds would come from the Hyatt Hotel sale. The drive-in announced in was closing permanently following the 2018 season that ended on October 13. It first opened in 1953 as the single-screen Rainbow Drive-In. It was renamed the Landmark Drive-In in 1974 and finally the Starlite in 1998. Landmark Commercial Real Estate is located at 156 North Emporia in Wichita.